Harbor Park, with its outstanding view and sound design, is one of the finest baseball facilities in existence. 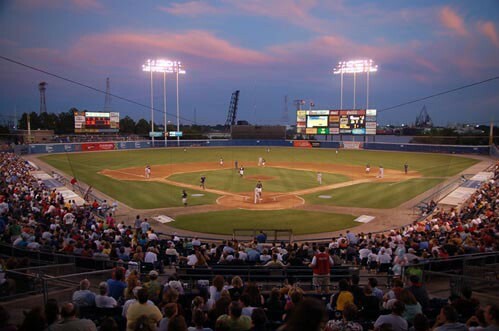 The ballpark is located in downtown Norfolk on the Elizabeth River, and was opened in 1993. The architectural firm chosen to design the crown jewel on the Norfolk waterfront was HOK Sport Facilities Group of Kansas City, MO. HOK Sports Facilities Group has also designed some of the finest major league parks, such as U.S. Cellular Field in Chicago, Oriole Park at Camden Yards in Baltimore, Jacobs Field in Cleveland, and PNC Park in Pittsburgh. Most recently, they have designed Comerica Park in Detroit, PETCO Park in San Diego, and Citizens Bank Park in Philadelphia. Harbor Park features almost 9,000 lower deck seats, 2,800 upper deck seats, and 400 seats in 24 luxury skyboxes leased to area corporations. The park also features a 225-seat restaurant known as “Hits at the Park” which offers a full view of the playing field. Overlooking left field is a 300-person tiered picnic area. Total capacity for Harbor Park is 12,067. The playing surface is Natural Grass, and the dimensions are 333 ft. in LF, 410 ft. in CF, and 338 ft in RF. The facility is owned by the City of Norfolk and the Tides have a 20-year lease. Its construction was financed by rent paid by the Tides and other revenue from non-baseball events held in the facility. The total cost of construction for the stadium exceeded $16 million. Harbor Park was selected by Baseball America as the finest minor league facility in the land in 1995.